Treadworms is an intestinal parasitic infection. These usually only affect foals under six months of age. Strongyloides are very fine worms of white colour (2 to 9 mm length on 0,05 mm broad) which parasitize all equids, but we can observe the effects only on the foal. Dormant infestations in pregnant mares are transmitted to foals via the milk, or by Strongyloides westeri's larvae present in the external environment which are swallowed directly, or which penetrate in the skin. The parasite carries out then several migrations (in the lungs, the bronchial tubes, then swallowed again), to finish in the intestine. The larva become adult and females will lay eggs which will be rejected in the faeces. However, a great number of these larvae will migrate in the mammary glands of the mare, and will go in the colostrum and milk. Also, a foal just born can be contaminated in the first day of its life. If the new born foal is contaminated it will have severe diarrhoea of greenish colour without fetid smell between the 9th and the 13th day of its life. This diarrhoea is accompanied by a strong dehydration, lose of weight and anaemia which will result in death. 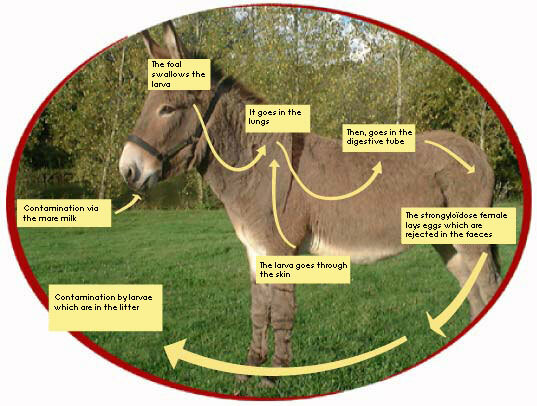 In the adult donkeys, the effects are very, or non existant. The majority of the wormers are effective against this parasite. It is advised to worm the mare the day before the foaling. If the new born foal is contaminated, repeated worming every two weeks are necessary. And, cure also for dehydration must be made.